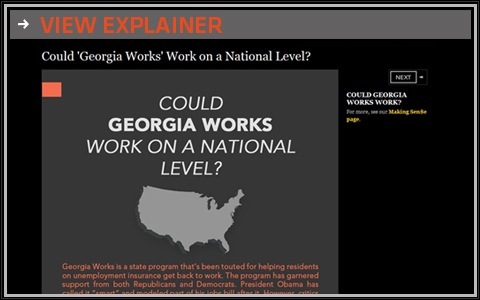 What is Georgia Works and Why Does the President Consider it a Model? Editor’s Note: On Wednesday’s program we examine Georgia Works, a state program that’s been touted for helping unemployed residents get back to work by pairing job seekers with employers who are willing to promise on-the-job training. The trainees are not paid, but are allowed to continue receiving unemployment insurance benefits while they’re enrolled in the program. The hope is that if there’s been a successful match, the employer will hire the trainee at the end of the program, which lasts up to eight weeks. The program, started in 2003 under a Democrat, Georgia Labor Commissioner Mike Thurmond, has averaged nearly 1,700 participants a year. That is, if 2010 is not included, when enrollment skyrocketed to over 18,000 due to an expansion that allowed all of Georgia’s jobless — not just those on unemployment insurance — to enter the program. It’s since been scaled back drastically under Republican Mark Butler, the department’s new commissioner, who says it had become too expensive. At the moment, a mere 21 people are enrolled. President Obama has called Georgia Works “smart” and modeled part of his Americans Jobs Act after it and the program has support from both Republicans and Democrats. Lis Cap gets on-the-job training at AppedOn through the Georgia Works program, where she learns how to build apps from Sosh Howell.